This article has been created to help you remove the [email protected] variant of CryptConsole ransomware and show you how you can decrypt files that have been encrypted by this ransomware on your computer. A new variant of the CryptConsole ransomware virus has been detected by cybersecurity researchers. The malawre now uses the e-mail [email protected] as a name of the files, that are encrypted by it, however it still drops the same README.txt ransom note on the computers of victims to convince them into paying ransom to get the encrypted files to work again. Unfortunately for the cyber-criminals, the ransomware is now decryptable and you can recover your files for free if you keep reading this article. Symptoms Files are no longer openable and are renamed plus contain the [email protected] file extension and a README.txt ransom note, asking victims to pay hefty ransom in BitCoin to get the files decrypted and working. Portable apps or versions of such. The [email protected] files ransomware is a variant of the CryptConsole viruses, which basically is a ransomware that is available for purchase or download in the deep web marketplace. From there, anyone who downloads the malware may modify it according to their needs. 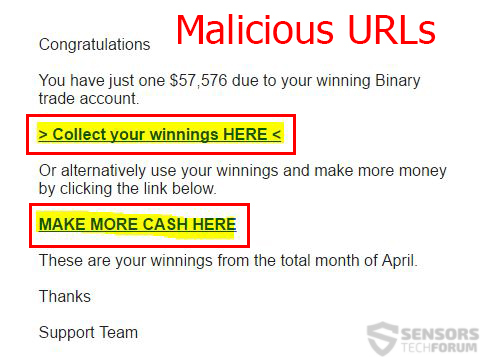 This is known as ransomware as a service (RaaS) and it is done to make money for the malware author of this virus, whether it is done by selling the malware or simply taking percentage of BitCoins paid from ransom. After doing so, the ransomware may also show it’s README.txt ransom note to the victim, which ususally asks to contact the crooks via their e-mail and negotiate the future of your files, which is not advisable, because the CrytptConsole family of viruses are all decryptable. If you want to get rid of the [email protected] version of CryptConsole ransomware, we urge you to follow the removal instructions below. If manual removal does not seem to help, be advised that according to security analysts the best method to remove this virus is automatically with the aid of an advanced anti-malware software. Such tool will effectively scan your computer for malicious files and make sure that it is completely protected from those by removing them and setting up real-time protection in the future. Furthermore, after removing this variant of CryptConsole ransomware, you can follow the “Decryption Instructions for CryptConsole Ransomware” underneath as they have information how to use the CryptConsole Decrypter by Michael Gillespie (demonslay335) to restore your files for free. Hey !, I found this information for you: "How to Decrypt heineken@tuta.io Files For Free (CryptConsole Virus)". Here is the website link: https://sensorstechforum.com/decrypt-heinekentuta-io-files-free-cryptconsole-virus/. Thank you.